The Uruguay Round of negotiations in the GATT took over four years to prepare, and seven more years to complete. Failure often threatened; success was not certain until the very last days of the negotations. The most ambitious worldwide negotiations ever attempted on trade matters--perhaps, indeed, on any economic subject-- the Round covered an enormous range of questions, some highly sensitive. Over one hundred governments took part in these negotiations, defending the interests of countries of all sizes, stages of development and economic structures. Unlike previous GATT negotiations, this one spilled over into the political arena, sparking sharp controversy, international tension, and in some countries even riots. The agreements reached are expected to influence world growth and development for decades to come. Since the Uruguay Round agreements were signed in April 1994, they have been widely discussed and analyzed. Studies have sought to estimate their impact on world economic growth, production patterns, and world trade. This book, however, has a different purpose: to trace the history of the Round. 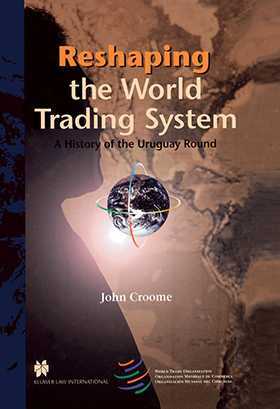 It seeks to explain, in as accessible and non-technical a way as possible, how the Uruguay Round came about, why it covered the subjects it did, what the participants sought, and the twists, turns, setbacks and successes in each sector of the negotiations.